on left bank on Fairfield Road in Two Bridges, 400 ft downstream from the Pompton River, 1.4 mi northwest of Little Falls, and 3.2 mi upstream of Beatties Dam. PERIOD OF RECORD.--Annual maximum, water years 1989 to current year. Occasional low-flow measurements, water years 1991 and 1996 to current year. REVISIONS HISTORY.--WDR US-2013: Drainage area. GAGE.--Water-stage recorder with telemetry. Datum of gage is 155.00 ft above NGVD of 1929. REMARKS.--Annual peak data can be obtained by selecting Peak streamflow from the 'Available data for this site' drop-down menu above or by using this link. EXTREMES FOR PERIOD OF RECORD.--Maximum gage height, 17.17 ft, Aug 30, 2011. EXTREMES OUTSIDE PERIOD OF RECORD.--The flood of Oct 10-11, 1903 reached a stage of about 18.5 ft, and may have been affected by the failure of the Pompton Lake Dam on the Ramapo River, based on data in the New Jersey Division of Water Policy and Supply, 1957 report entitled "Floods on the Passaic and Pompton Rivers at Wayne Township, Passaic County, New Jersey.". DISCRETE DATA: Water years 1987-96, 1999, and 2008 to current year. Dissolved Nitrate plus Nitrite: July 2009 to current year. Dissolved Organic Carbon: July 2009 to current year. Dissolved Oxygen: April 1989 to current year. Dissolved Oxygen, Percent of Saturation: October 2001 to current year. pH: November 2005 to current year. Specific Conductance: April 1989 to current year. Water Temperature: April 1989 to current year. Total Chlorophyll-a: July 2010 to current year. Turbidity: December 2011 current year. REMARKS1.--The station is 400 ft downstream from the confluence of the Pompton River with the left bank of the Passaic River. One water-quality sensor (monitor) measures the characteristics of water pumped sequentially from three separate intakes. 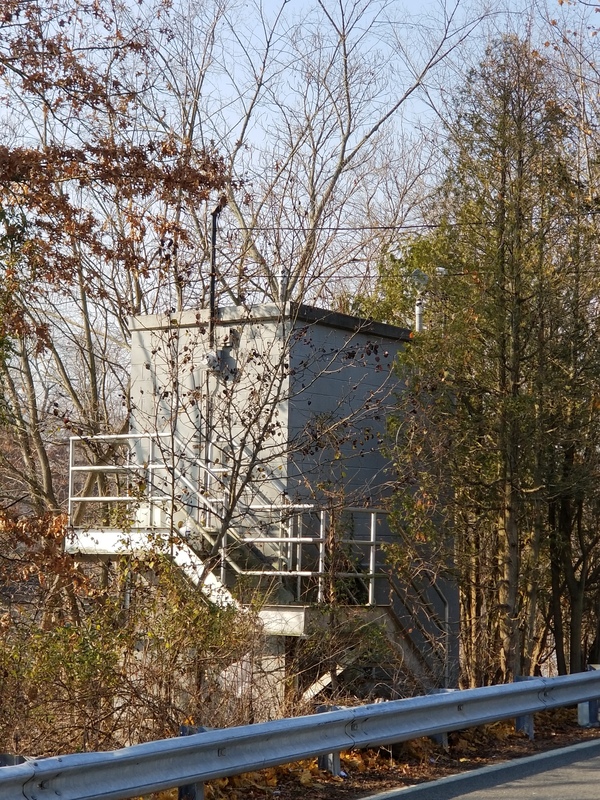 The station may be impacted by occasional diversion of water from the Pompton River 750 ft upstream from its junction with the left bank of the Passaic River, which is 400 ft upstream from the station. If depicted, daily-mean-diversion records are comprised of diversions to Wanaque Reservoir and Little Falls Water-Treatment Plant, but not any intermittent diversion to Oradell Reservoir. Interruptions in the daily record were due to instrument or pumping-system malfunction. The accuracy of continuous water-quality data can be found here. DISSOLVED NITRATE PLUS NITRITE: Maximum, 6.42 mg/L as N, from right intake, Nov 18, 2013; minimum, 0.04 mg/L as N, from right intake, Mar 15, 2010, from left and right intakes, Aug 29, 2011. DISSOLVED ORGANIC CARBON: Maximum, 10.5 mg/L, from right intake, Jul 10, 2013; minimum, 2.22 mg/L, from left intake, Feb 03, 2014. DISSOLVED OXYGEN: Maximum, 20.0 mg/L (measuring limit of instrument), from left and right intakes, on many days during Jul through Sep, 1999, from right and middle intakes, Jul 25, 2001; minimum, 1.1 mg/L, from left and middle intakes, Apr 20, 2002. DISSOLVED OXYGEN, PERCENT OF SATURATION: Maximum, 253%, from right intake, Aug 19, 2002; minimum, 12%, from left and middle intakes, Apr 20, 2002.
pH: Maximum, 9.6 standard units, from left intake, Aug 3, 2007; minimum, 6.3 standard units, from right intake, May 30, 31, 2013. SPECIFIC CONDUCTANCE: Maximum, 3,370 microsiemens/cm, from right intake, Feb 4, 2011, from middle and right intakes, Feb 14, 2017; minimum, 101 microsiemens/cm, from right intake, Sep 19, 20, 1999, from left intake, Aug 29, 2011. WATER TEMPERATURE: Maximum, 31.4°C, from left intake, Jul 7, 1999; minimum, 0.0°C, from left and right intakes, on many days during winters. TOTAL CHLOROPHYLL-A: Maximum, 69.3 micrograms/L, from left intake, Mar 30, to Apr 2, 2012; minimum, <1 micrograms/L, from left intake, on many days. TURBIDITY: Maximum, 110 FNU, from left intake, Jul 31, 2016, from middle and right intakes, Aug 1, 2016; minimum, 0.8 FNU, from left intake, Oct 6, 7, 10, 2013. National Weather Service flood stage for this gage is 9.0 ft.
Add up to 2 more sites and replot for "Temperature, water, degrees Celsius, ,from left intake"
Add up to 2 more sites and replot for "Temperature, water, degrees Celsius, ,from middle intake"
Add up to 2 more sites and replot for "Temperature, water, degrees Celsius, ,from right intake"
Add up to 2 more sites and replot for "Specific conductance, water, unfiltered, microsiemens per centimeter at 25 degrees Celsius, ,from left intake"
Add up to 2 more sites and replot for "Specific conductance, water, unfiltered, microsiemens per centimeter at 25 degrees Celsius, ,from middle intake"
Add up to 2 more sites and replot for "Specific conductance, water, unfiltered, microsiemens per centimeter at 25 degrees Celsius, ,from right intake"
Add up to 2 more sites and replot for "Dissolved oxygen, water, unfiltered, milligrams per liter, ,from left intake"
Add up to 2 more sites and replot for "Dissolved oxygen, water, unfiltered, milligrams per liter, ,from middle intake"
Add up to 2 more sites and replot for "Dissolved oxygen, water, unfiltered, milligrams per liter, ,from right intake"
Add up to 2 more sites and replot for "Dissolved oxygen, water, unfiltered, percent of saturation, ,from left intake"
Add up to 2 more sites and replot for "Dissolved oxygen, water, unfiltered, percent of saturation, ,from middle intake"
Add up to 2 more sites and replot for "Dissolved oxygen, water, unfiltered, percent of saturation, ,from right intake"
Add up to 2 more sites and replot for "pH, water, unfiltered, field, standard units, ,from left intake"
Add up to 2 more sites and replot for "pH, water, unfiltered, field, standard units, ,from middle intake"
Add up to 2 more sites and replot for "pH, water, unfiltered, field, standard units, ,from right intake"
Add up to 2 more sites and replot for "Chlorophylls, water, in situ, fluorometric method, excitation at 470 +-15 nm, emission at 685 +-20 nm, micrograms per liter, ,from left intake"
Add up to 2 more sites and replot for "Chlorophylls, water, in situ, fluorometric method, excitation at 470 +-15 nm, emission at 685 +-20 nm, micrograms per liter, ,from right intake"
Add up to 2 more sites and replot for "Turbidity, water, unfiltered, monochrome near infra-red LED light, 780-900 nm, detection angle 90 +-2.5 degrees, formazin nephelometric units (FNU), ,from left intake"
Add up to 2 more sites and replot for "Turbidity, water, unfiltered, monochrome near infra-red LED light, 780-900 nm, detection angle 90 +-2.5 degrees, formazin nephelometric units (FNU), ,from middle intake"
Add up to 2 more sites and replot for "Turbidity, water, unfiltered, monochrome near infra-red LED light, 780-900 nm, detection angle 90 +-2.5 degrees, formazin nephelometric units (FNU), ,from right intake"
Add up to 2 more sites and replot for "Nitrate plus nitrite, water, in situ, milligrams per liter as nitrogen, ,from left intake"
Add up to 2 more sites and replot for "Nitrate plus nitrite, water, in situ, milligrams per liter as nitrogen, ,from right intake"
Add up to 2 more sites and replot for "Dissolved organic carbon (DOC), water, in situ, regression computed, milligrams per liter as carbon, ,from left intake"
Add up to 2 more sites and replot for "Dissolved organic carbon (DOC), water, in situ, regression computed, milligrams per liter as carbon, ,from right intake"